When a nomad stops moving. Sometimes when I’m sitting in my cabin, my mind turns to having a pet: a dog or a cat. I forget how much work and money a pet takes. I forget that a pet will tie me down. That I can forget about hiking or travel. And sometimes, when I’m snug in my cabin, I think why do I need to go anywhere? I could just stay here, build my cob house, plant a garden and have a pet. Sounds nice. But I know the need to roam will rear up in me after awhile and I will be antsy for adventure. 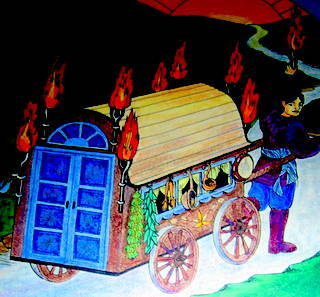 Posted on November 3, 2006 December 1, 2006 Author crowCategories Cabin and Car living, General1 Comment on When a nomad stops moving. For taking long walks on ice and packed snow, nothing works better for me then screwing sheet metal screws in to my shoes. 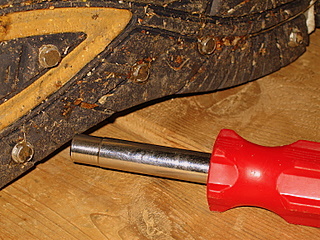 I get the kind with the hex nut head, 3/8 inch long for the toe and 1/2 inch long for the back of the shoe. For complete instructions visit http://www.skyrunner.com/screwshoe.htm. I don’t have a hex nut attachment for my cordless drill so I used my screwdriver’s hex nut driver and did it by hand. The screw driver is called a 6 way all in one screwdriver. Last year I went through 2 pairs of Yak-Traks: they broke after about 2 weeks of use. Then I tried a pair of light weight instep crampons but they were always slipping up and I had to stop and adjust them all the time. Then I learned about the screw shoe. When spring came I just took out the screws and my running shoes where fine. NOTE: Change into screw less shoes before walking on nice floors. Posted on November 3, 2006 February 22, 2008 Author crowCategories Adventure gear and techniques, Cabin and Car living4 Comments on Ice shoes. 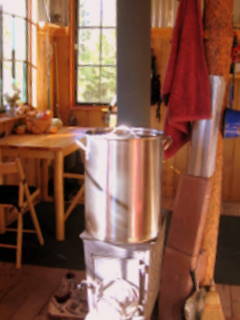 My winter hot water system is the pot from the 8 gallon turkey fryer that I bought at Costco, for 99.00 dollars. It comes with a large colander. When there is snow I fill the colander with snow and drop it in to the partially filled pot and it instantly melts. It also stores heat from the stove. Whenever I need hot water, I dip it out with a small pan hanging nearby. The only drawback is it takes up most of the room on my stove. There is just enough room left to squeeze my backpacking pot in. During the summer I use the propane burner that it comes with to heat my water. Posted on October 30, 2006 November 16, 2006 Author crowCategories Cabin and Car living, GeneralLeave a comment on My hot water system. 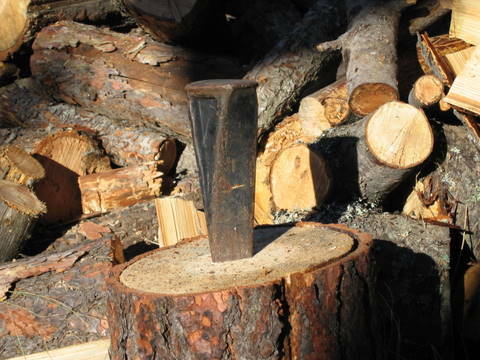 With a twisted wedge, I can split any piece of wood, no matter how knotty or green, and it never gets stuck. I just put it on the log, hit it with a sledge hammer a few times, and the log splits. A Vagabond’s guide to kitchenware and dishwashing. Eat heartily, out of the pot, with big spoon. Scrape out pot with spatula. Licking off the spatula as you go. Pour hot water into Nalgene bottle and add instant coffee, hot chocolate, or tea. Now your pot is clean and you didn’t have to waste any water or time to clean it. Pot I have the MSR Titan Kettle . It weighs 3 oz (85 grams) without the lid. This pot cost a lot. You can find a small aluminum pot in discount stores that will be just as light for 3-4 dollars. Don’t look for the pot in the pot section, look for it in the section that has cheese graters and lemon juicers. I found a pot there that holds a liter of water, weighs 3.5 ounces and has a handle. It was called a chocolate melting pot, I think. For more pot options see this helpful page on pots: Zen Stoves- pot page. 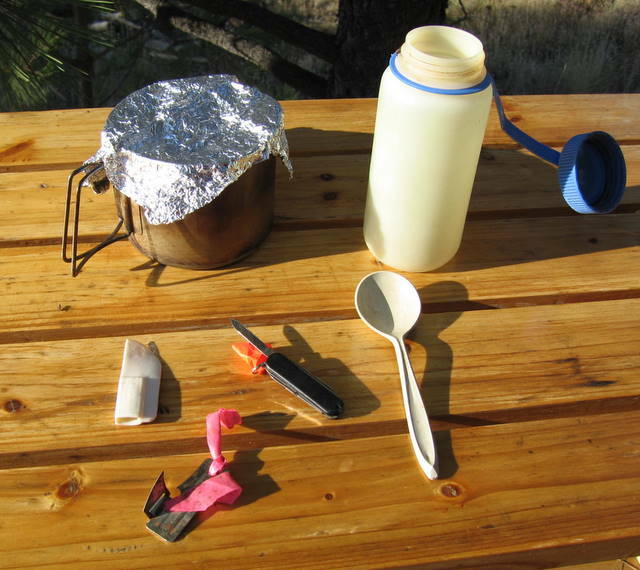 Foil lid– Weighs .10 (2 grams) Makes a lighter weight lid then the one the pot came with. It can also be used as a pot holder to grab the hot handles with. Also handy to have if you need to funnel a seep into your water bottle. A piece of foil probably has hundreds of uses. Spoon. My favorite spoon was a metal Chinese spoon that I got in Thailand, but it disappeared and I can’t find another in the US. Right now I’m using a polycarbonate spoon, it weighs .35 ounce(9 grams). Bottle. The 16 oz nalgene wide mouth loop-top -polyethylene water bottle weighs 2.5 ounces (70 grams). The Nalgene bottle of course is also useful for carrying water, dipping cup for shallow water sources, a teapot, and a hot water bottle. I have kept warm on many cold nights with a nalgene bottle filled with hot water in my sleeping bag. It has never leaked. Eventually the Nalgene bottle gets pretty stained and sort of gross looking. Just fill with water and a little bleach and let it soak for a bit, add the spoon while you are at it. It will be clean in no time. The hard clear Nalgene lexan bottle doesn’t seem to stain, as badly, but it weighs an ounce more. Spatula head. I find the smallest most flexible spatula I can, and take just the head off of it. Here is one that also has a scraper on one side of it. P-38 can opener. Weighs .30 ounces (9 grams) Tie a piece of flagging tape through the hole so that it is not so easily lost. Knife– weighs .75 ounce (21 grams) I pack the Swiss Army Classic Pocket Knife. Again, tie a piece of flagging tape through the eye so you don’t lose it. Besides a knife it also sports a pair of scissors- that are strong enough to cut my toe nails, a tweezers, tooth pick, file and screwdriver. Posted on October 24, 2006 March 11, 2016 Author crowCategories Adventure gear and techniques, Cabin and Car living, General3 Comments on A Vagabond’s guide to kitchenware and dishwashing. Pat’s guide to substandard living. I wouldn’t own a car I couldn’t sleep in. I once lived quite well, out of my Subaru Justy. I moved the passenger seat up all the way and flipped the back of the seat forward then I put a piece of plywood to bridge the gap between the front seat and the back seat and then put a foam pad over it all and made a comfy bed. On the other side of the car, I put an ice chest to hold my food, which doubled as a side table to put my coffee cup on. I used a small canister backpacking stove to cook on. A five gallon bucket of water with a lid and a spigot went in the back. I had a large wooden bowl to use as a sink. In the little back side pocket I kept a led head lamp and a book. My clothes were kept in a bag in front on the passenger’s side. My towel was kept hanging over the water bucket. Make your home beautiful. I covered the cooler with a colorful small rug and had a bright bedspread from Thailand on the bed. I had lots of pillows and plenty of covers to keep me warm. When I would head for my car at the end of the work day it felt as inviting as any home. Make your home someplace with a beautiful view; even if it’s just for a night; seek out beautiful places to park your car or live. Life is full when the view is good. Keep your home tidy– Living in small places demands tidiness. A place for everything and everything in its place. If you don’t live by this adage your place will be cluttered and frustrating to live in. Just get in the habit of being tidy and clean up every day. Get rid of stuff you don’t need. Clothes washing– When on the road I would have 2 sets of clothes: My work clothes; my non-work clothes. Every day I wore the same work clothes then took a shower at the health club and changed into my nonwork clothes. At the end of the week I would change into my raingear and wash both sets at the laundry mat. When living in a more permanent situation as in my cabin, I use my bathing water to wash out my underwear and socks as needed. Once a week I bathe in an 11 gallon wash tub. After my bath I put my clothes in and let them soak overnight. Every once in a while I stomp on them like I was crushing grapes with my feet. In the morning I wring them out and hang them up to dry. I usually wear the same clothes all week. Posted on October 20, 2006 November 23, 2006 Author crowCategories Cabin and Car livingLeave a comment on Pat’s guide to substandard living.